Greg Feasel is recipient of a 2018 Distinguished Alumni Citation. Greg Feasel (’81), a rather tall transfer student from central California, was struggling in classes at ACU, which earned him a visit to the office of Dr. Dwain Hart in Fall 1977. Hart, professor and chair of health, P.E. and recreation at the time, was a kind man. He also was a direct man, moving instantly to his point. He demanded Feasel show complete devotion to scholarship. And he demanded he sit in the front row of all classes. This was, it turned out, superb advice. This was, alas, bad news for all who sat behind their 6-foot-6, 270-pound classmate. They couldn’t see the professor for the rest of the semester. “You need to sit in the front row,” Feasel said, laughing nearly 41 years after his conversation with Hart. “I use that today. I kind of size people up that way. If somebody sits in the back of the room, that tells me something, especially if they’re racing for the back row. Feasel did not flunk out. Hart’s challenge ignited the considerable, if dormant, fire in Feasel’s gut. He became a diligent student, earning a B.S.Ed. degree, and a superlative offensive lineman, one of the finest in ACU history. He earned All-America honors in 1979 and left many sturdy linebackers flat on their backs. He played in the NFL for the Green Bay Packers and San Diego Chargers. He and his late brother, Grant (’83), formed an epic tandem on the Wildcat offensive line as future inductees to ACU’s Sports Hall of Fame. Then he brought his focus and hunger to the business world. 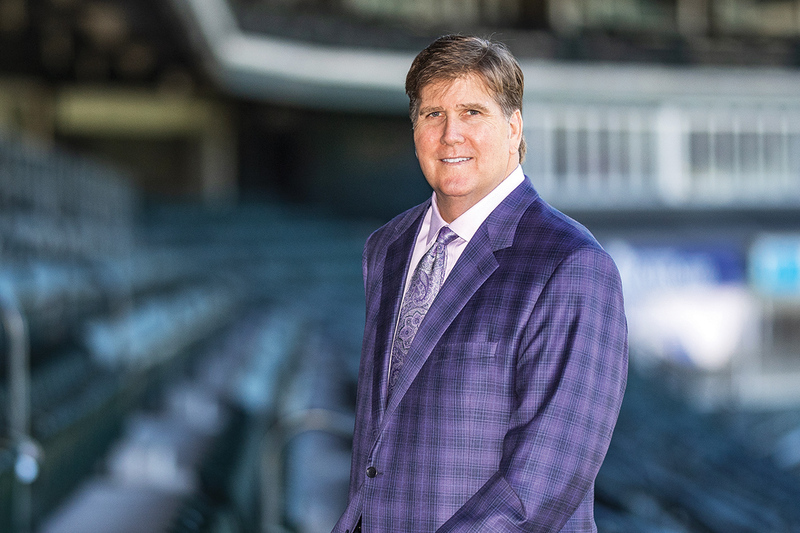 Today, Feasel serves as chief operating officer of the Colorado Rockies Baseball Club. He adores his job, the culmination of 23 years with the team. He gives much credit for his rise to his years on the Hill, and is a tireless advocate for his alma mater. He became close friends with many ACU coaches and professors who pushed and inspired him. Football coaches Ted Sitton (’54) and Don Smith (’53). Basketball coach Willard Tate. Track and field coach Don W. Hood (’55). Professors Hart, Dr. Kelly Hamby and Dr. Dale Priest. View more from David Ramsey.